Is your organization considering implementing a new ERP system? If so, think carefully about the implementation process before you start, because it can have a major impact on your employees. In this blog, you can learn how Cadran successfully implemented JD Edwards ERP at Interfood. Interfood is a leading global supplier of dairy products, with 16 offices worldwide. All of these offices work with different ERP systems. 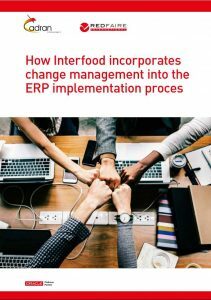 In order to align its procedures at global level and to make itself more competitive, Interfood decided to implement a common ERP system. It opted for Oracle’s JD Edwards. Interfood chose Cadran to implement the system because we have developed a special module for commodity traders. The first office to migrate to this new system is the Dutch office. Sanne van Hoeij, Change Facilitator and HR Advisor at Interfood, describes the step-by-step plan that resulted in successful implementation. The first step in the implementation of a new system is the setting up of a project team. This team comprises Global and Local Key Users from the various key disciplines (Trade, Logistics & Finance) who are supported by Global Business Process Owners. Key Users from IT, Data and Reporting are also involved. Sanne from HR, who is responsible for change within Interfood, is also involved in the project. These individuals all work closely with Cadran’s consultants. The name of the project is Project Unite, because it helps bring all the offices together and ensures that they all work in the same way. If the process is to run smoothly, it is important that everyone within the organization is kept properly informed. Interfood does this by giving presentations on the status of the project, for example. It also gives demonstrations of the new system and vlogs on peoples’ experiences of the system are shared. Before you start using a new system, it is important to test it thoroughly. During these tests, a number of colleagues who have not been involved in the project before go through the various business flows. In this phase, all colleagues become increasingly interested in the new ERP and are keen to see what the system has to offer. Once testing is complete, it is important to train all employees on the system. With this in mind, eighty training modules were developed and, on Cadran’s recommendation, a tool whereby a camera videos the transactions in the system to which text can then be added was used. The training is largely based on self-study and comprises, amongst other things, e-learning modules with videos and process descriptions. Key Users and testers also deliver training sessions. Within three weeks, all 150 employees were ready to use the system. After the training phase comes a transition period during which all Interfood partners are brought up to speed with the new system and the potential impact that it will have on them. The Dutch system will be migrated over the course of a weekend. The process will start on the Friday with farewell drinks to mark the departure of the old system and will end on the Tuesday with a toast to the new system. All staff will be in the office on the Saturday and Sunday so, on the Monday, the JD Edwards system can be used immediately. Thereafter, Cadran and Redfaire International will help with optimization of the system. The next step? Rolling the system out worldwide, starting with Poland!